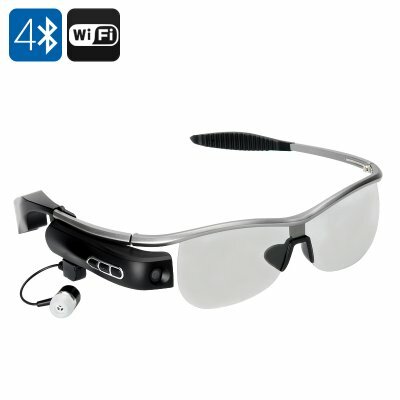 Successfully Added WEAR Bluetooth Smart Glasses - Bluetooth 4.0, Polarized Lens, Wi-Fi, 8MP Camera, Video Recorder, 8GB ROM to your Shopping Cart. Feel like a true secret agent by roaming around town in these cool Bluetooth smart glasses. Coming with an 8MP camera they can record videos onto your phone, have built-in Wi-Fi, voice broadcast and more. These cool blue glasses may look like the latest fashion fad ¬– but don’t be fooled. They can offer you much more than approving looks from a fashionista. The glasses are not only pretty, but also smart – and will let you strut on the busy city streets like a 007. The Bluetooth glasses come with a built-in 8MP camera and will let you take photos of your surrounding without getting too much attention onto yourself. You will also be able to use your phone to record what you are viewing in the glasses – a pretty cool feature for undercover agents. If you spend most of your time behind the wheel, the glasses will not only protect you from the in-your-face sunlight, but also double as a DVR catching, letting you capture what’s happening on the road without any additional equipment. Once you’ve connected the glasses to your smartphone – they come with both iOS and Android support – you will also be able to answer or reject incoming calls. Once again, this feature comes in really handy when you are driving or don’t want to get your smartphone out. The Bluetooth smart glasses come with 8GB of internal memory and a 500mAh battery that is good for up to 5 hours of continuous recording or 14 hours of non-stop talking time. Standby time is 8 to 10 days. The Bluetooth smart glasses comes with a 12 months warranty, brought to you by the leader in electronic devices as well as wholesale Bluetooth smart glasses..